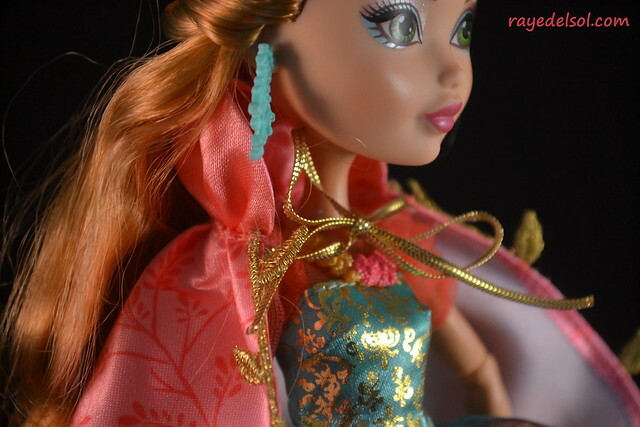 Ashlynn comes with light blue eyeshadow with some pink on her upper lids. She has a silvery glitter that extends to her dark blonde eyebrows. She wears adorable pink lipstick with no three-dot lip shine. 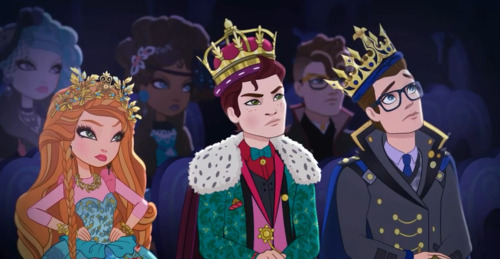 There are several people that were upset about this crown. 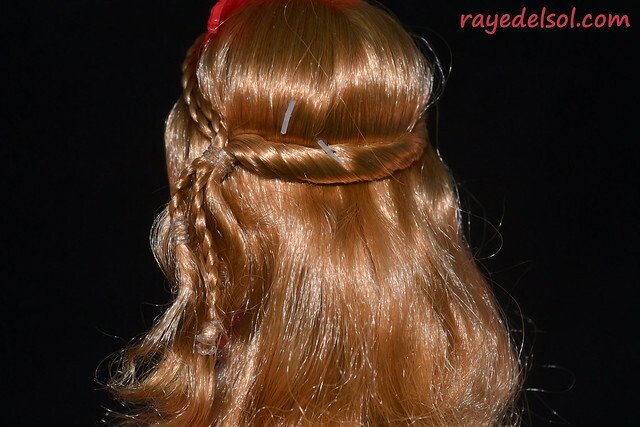 In the Legacy Day special, Ashlynn wears a golden crown. I actually like this change. The pink in her crown matches the pink all over her. 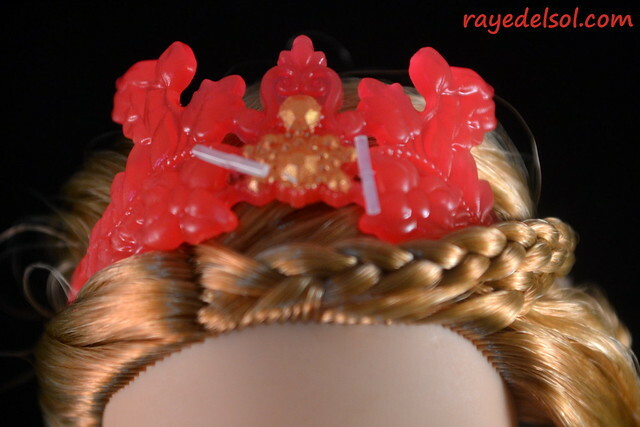 The crown features flowers and leaves. Ashlynn wears a gold leaf/vine necklace that ends in two pink flowers. Ashlynn’s ring features a tiny bird. The ring stands up very high on the doll. Ashlynn wears two bracelets: a pink one with flowers and vines that matches her necklace and a golden one with birds that matches the ring on the other side. The top of the dress is light blue/teal with gold leaves. The bottom skirt is a tight pencil-style skirt in a light blue/teal with gold flecks. It reminds me of her signature outfit. Now for the part that makes me upset…. This train. This is nothing like I’d imagined her doll to be, nothing like the Legacy Day Special. This one piece is the source of why I disliked the doll originally. As it is, the dress is adorable, it was just difficult to appreciate it for what it is because of what I wanted. 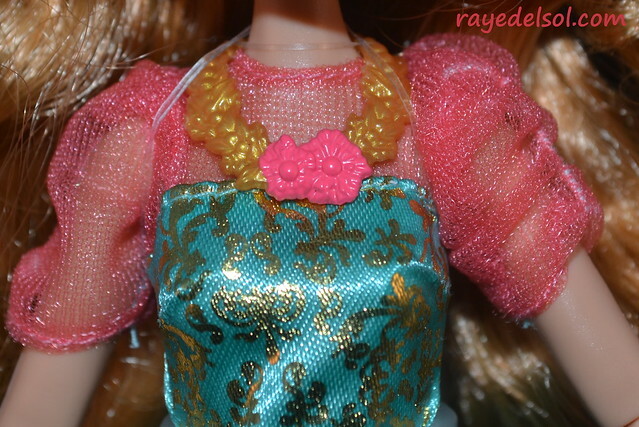 The dress has three layers. The top is a sheer light blue layer with flowers lining its bottom. The next is a soft layer of light blue with pink/yellow flowers. The bottom layer has the same design as the top, but is sheer. The dress is one piece with a velcro enclosure in the back. Ashlynn wears black fishnet stockings adorned with golden sparkles. Ashlynn’s shoes are the same color as her crown. I love this head-to-toe motif. 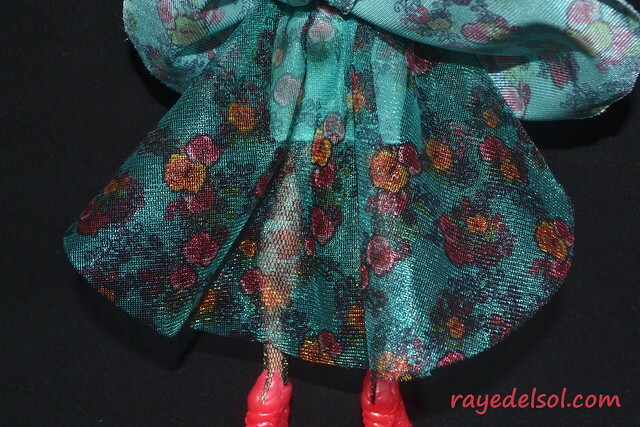 Her shoes feature the same flowers and leaves that have been all over this outfit. Like her crown, many people were upset about these shoes. I’ve come to love them! Ashlynn has a golden purse with pink flowers and a bird on the wooden handle. 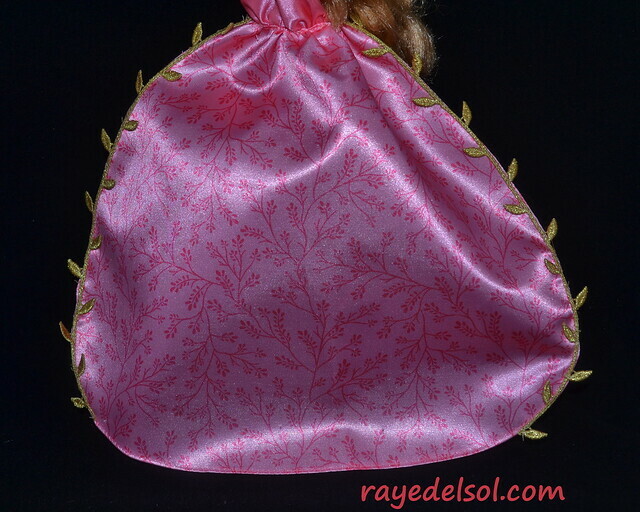 The Ashlynn doll comes with this large pink cape. I’m not a huge fan of this thing. It is made of stiff material. 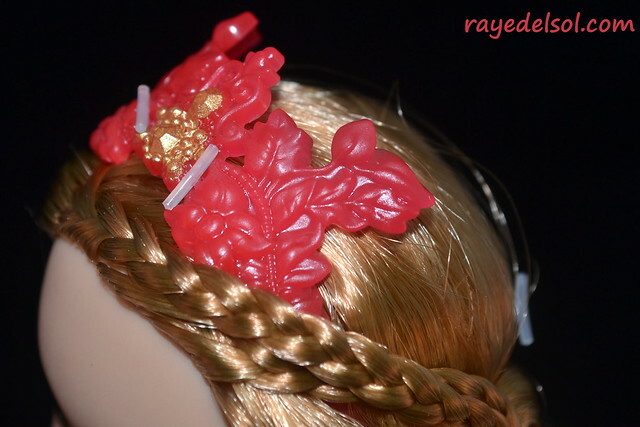 It is outlined in golden leaves that are also a bit stiff. The cape comes up to a collar that attaches to a piece of golden ribbon that closes the cape with a tie. 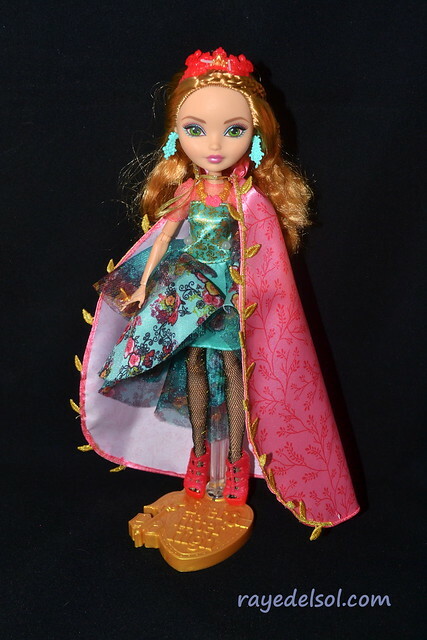 Ashlynn comes with a light blue/teal “Storybook of Legends” and a golden key (not pictured here). The Wave 2 dolls comes with much thinner books than the Wave 1 dolls. Maybe Mattel thought these stories weren’t as long? Or that we really don’t have shelf space for all of these books? So what if you only want one Ashlynn? Which one should you pick? 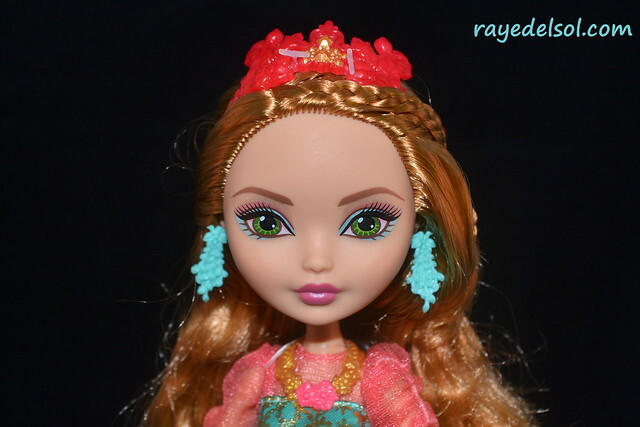 The light blue eyeshadow on the Legacy Day doll makes her eyes pop more. Her lipstick is also darker than the signature doll. The signature doll has more subdued makeup. 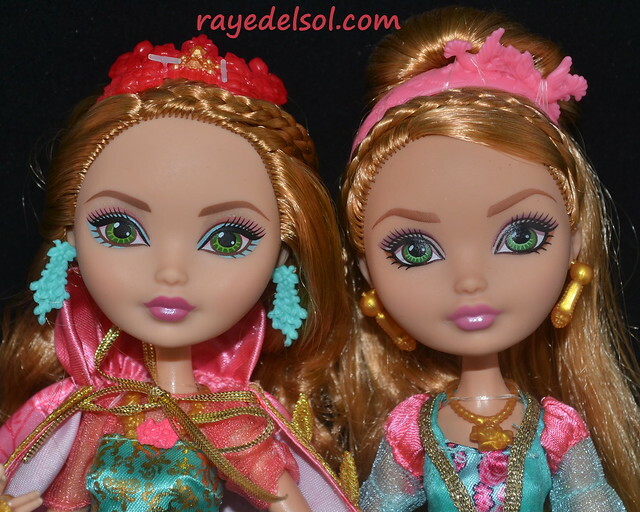 Both dolls are the same height and have the same color schemes. If I could only have one, I’d probably choose the signature doll, just because she is more true to the original designs. Legacy Day Ashlynn is a beautiful doll. If you never compare her to the Legacy Day special, she is just adorable and perfect! Unfortunately, I saw the Legacy Day special first, and she will just never live up to what I want. 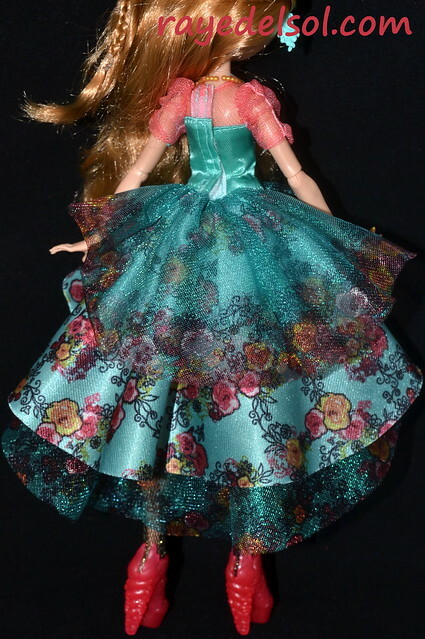 I agree with you 100%, this doll should have been better… I don’t really like Ashlynn that much but I think the first Ashlynn with the dress from the new one would look great. I have to say I really love the lighting in these photos, it fits the doll. I do love Ashlynn dearly (the doll, not her character), but I was very disappointed with this doll. Nonetheless, I still want the outfit for myself (LOL!). I love her new (variation of original?) green eyes! They really pop. Hope I’m not spamming you with comments, haha sorry! Oh wow! Those are some awesome edits to her dress!!! I’m totally jealous! 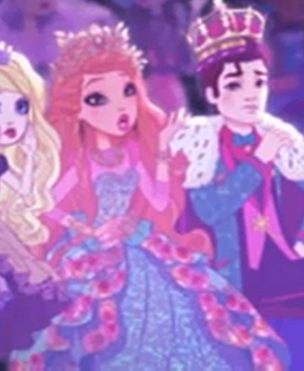 Ashlynn’s original webisode dress looked very Cinderella inspired. If there was a Thronecoming Ashlynn, I think that’s what she should have worn. I realized her shoes are the same as mmirror beach Apple’s. But different color. I wish I had a dolls from the EAH and MH television shows and all. Even the dolls not seen that much (ex. Courtly Jester.) I heard that Courtly was gonna go to EAH who nows though so what tell me if she would be a rebel or a royal. FAST TIME IS RUNNING OUT OF BLOG.